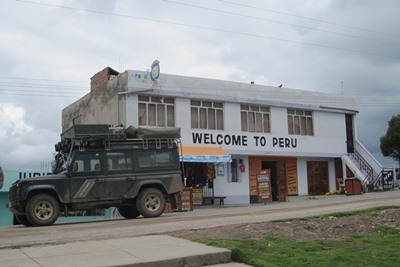 When passing the Peruvian border, custom agents are very nice. 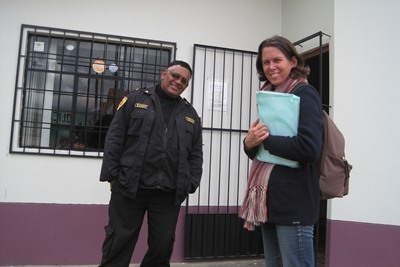 But 30 meters after the border post, we have to stop at a police station. 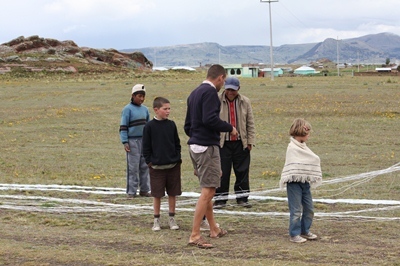 "Is there not a voluntary contribution to repaint the police station?" 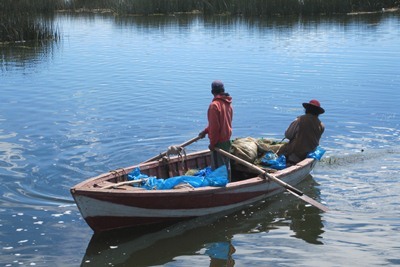 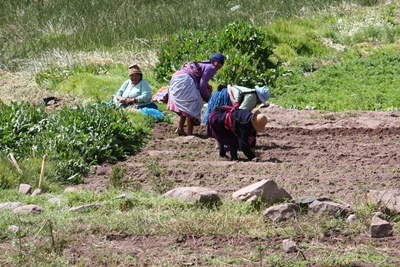 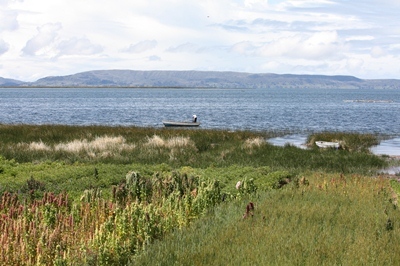 We go around the Lake Titicaca and we notice that the small fields are better maintained than in Bolivia. 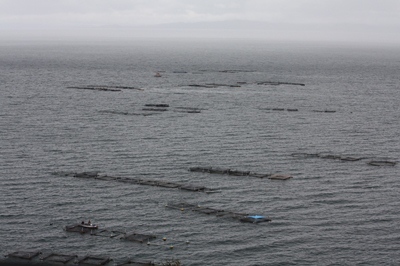 There is not a single square meter not used, and we can see many trout farms on the lake. 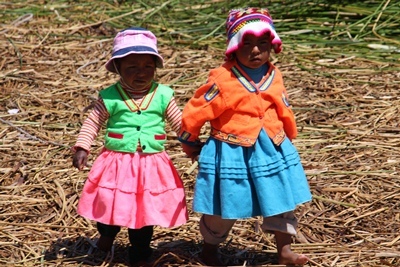 As we could see in Bolivia, the Indians still live, work and celebrate in community. 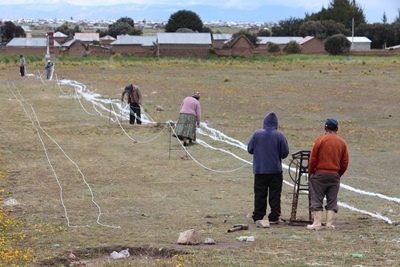 Along the road, we visit a strange rope factory. 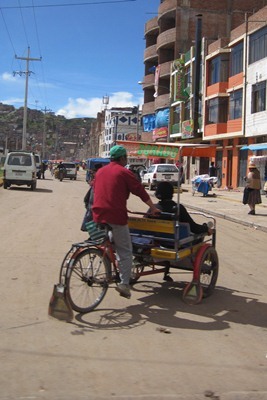 Arriving in Puno, there are many rickshaws as we could see in Egypt, but there are also pedal cars. 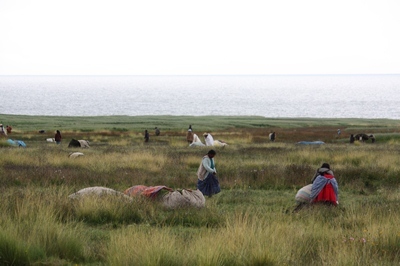 It's really a different atmosphere. 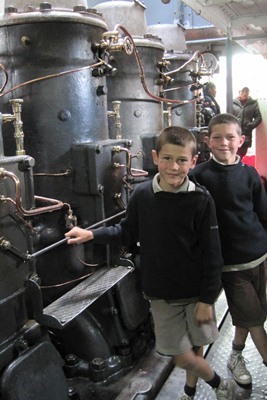 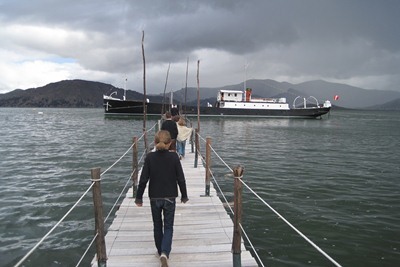 We visit the Yavari, a splendid steamboat, made in England in 1862 on behalf of the Peruvian army. 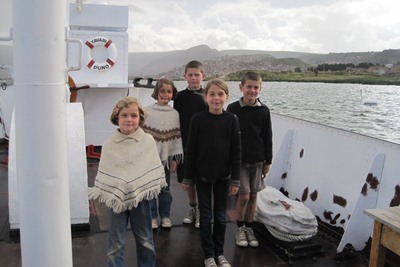 The ship was lauched 8 years later, after crossing the Andes in pieces loaded on mules. 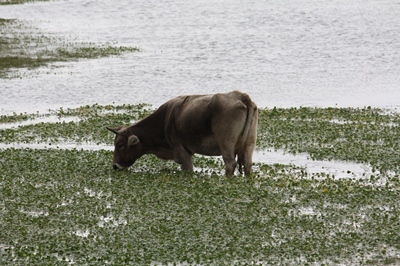 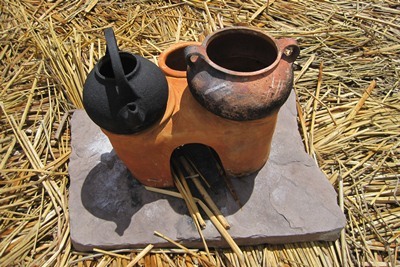 As coal is lacking on the Altiplano, the army was using dried llama dung as fuel! 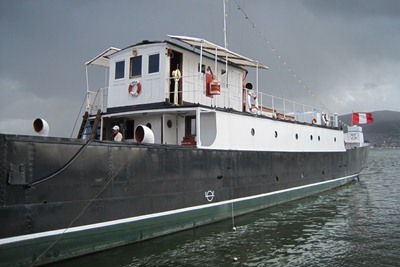 This boat was bought in 1982 by an association that works to restore it. 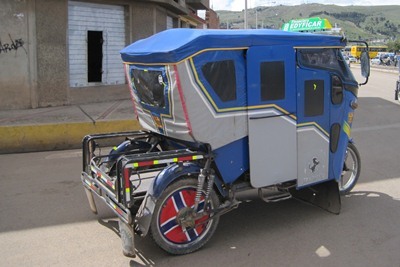 They did a tremendous job. 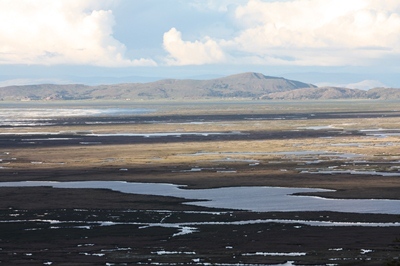 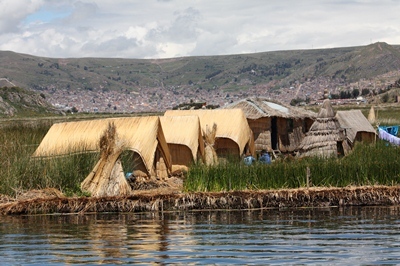 We camp with superb view over the Lake Titicaca. 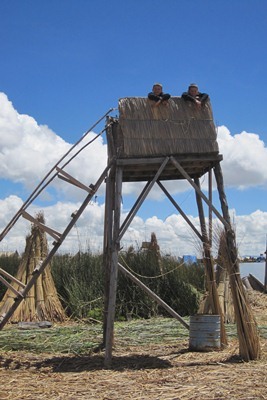 At this location it is much shallower and partly covered by Totora, a kind of reed. 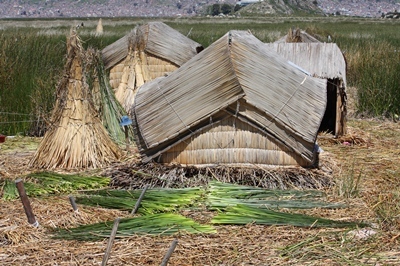 This plant is used by the Uros to make their famous floating islands. 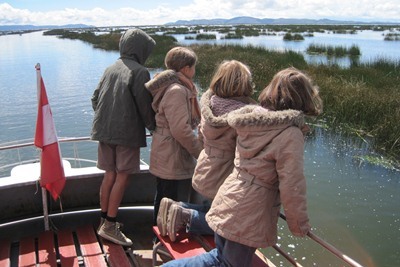 We rent a boat to explore this strange habitat. 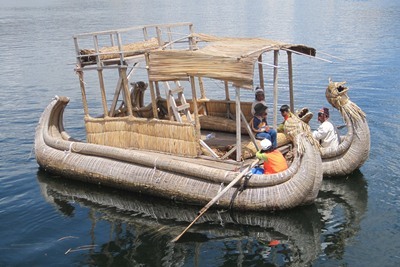 Everything in the universe is made from totora: islands, houses and boats. 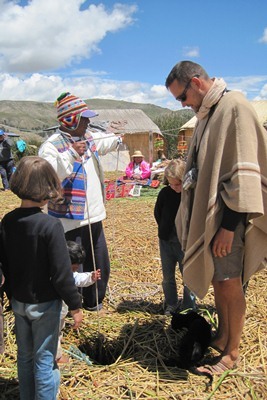 We land on an island where we are greeted by Juan, who shows us with a rock and a rope that the island does not touch the bottom. 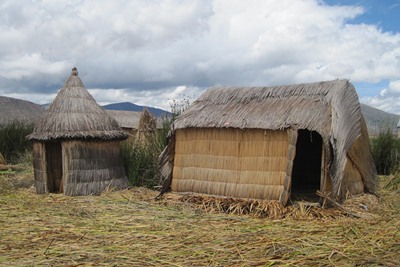 We discover the surprising lifestyle of these people who took refuge on floating islands to escape the oppression of the Incas. 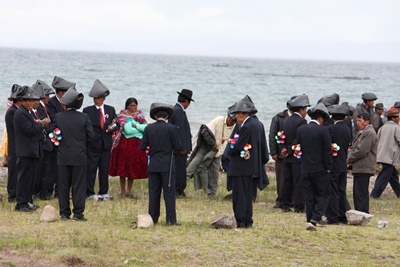 The visit was very interesting, although the development of tourism over the past fifteen years has pretty much modified the habits of the inhabitants. 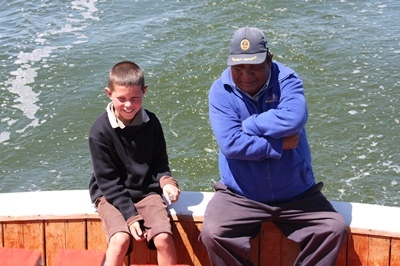 On our way back, Tugdual asks in Spanish to the Captain if he can take the helm ... and he is very proud to bring us back to the port.